McDonald’s sirloin burgers: A second try for the Angus Third Pounder. Would You Buy a Fancy Hamburger From McDonald’s? The sirloin burgers—one with bacon, another with mushrooms, and a third with classic lettuce-and-tomato toppings—are served on a wooden surface similar to a cutting board, aiming to signify freshness—an attribute McDonald’s image has been lacking lately. The keyword here is reintroduce, because a highly similar burger—the Angus Third Pounder—has been on the McDonald’s menu before. It first launched in 2009 but was pulled in May 2013 as beef prices rose and sales failed to take off. 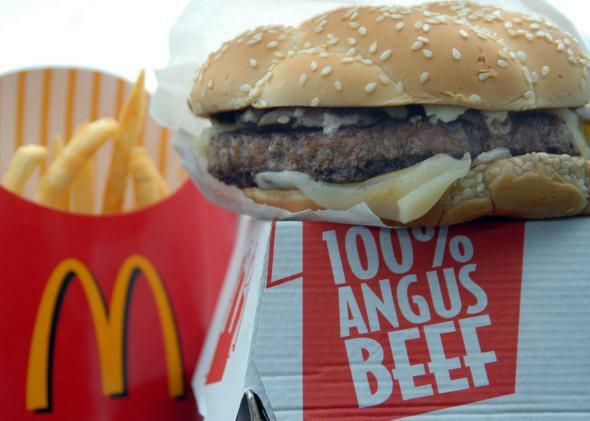 Customers seemed to feel that, at $4 to $5 apiece, the Angus Third Pounder wasn’t different enough from the Quarter Pounder or Big Mac to merit its significantly greater price. Around the same time, McDonald’s also did away with its upscale Fruit & Walnut Salad and Chicken Selects. “They are trying this again because a decent burger place has to have a premium burger,” said John Gordon, principal at Pacific Management Consulting Group. “Consumers are more sophisticated and expect better,” plus the company needs some pricier products to boost profitability. That’s all well and good, but the Angus Third Pounder is no Egg McMuffin. Adding another burger to the menu will also presumably complicate things in the kitchens that McDonald’s is known to be trying to simplify. The point is, it’s a little strange for a chain ostensibly trying to pare down its offerings to now be bringing back an option that failed after four years on the menu. But hey, you can’t be a “modern, progressive burger company”—one that earns back market share from, say, Five Guys and Shake Shack—without a modern, progressive burger. Maybe 2015 will be the Angus Third Pounder’s year to shine. *Correction, April 13, 2015: This post originally misstated that McDonald’s was bringing back the Angus Third Pounder. The new burger, while a third-pound burger sourced “100 percent from Angus and other breeds of cattle from North America,” is not 100 percent Angus and instead is being called the Sirloin Third Pound burger.